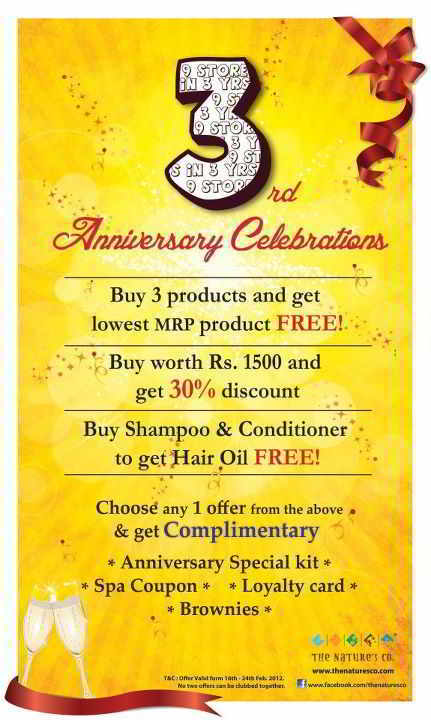 - Buy 3 products and get lowest MRP product FREE!. - Buy Shampoo and Conditioner to fet Hair Oil FREE! T&C : Offer valid from 16th to 24th Feb 2012. No Two offers can be clubbed together. Everything happens to everybody sooner or later if you put your mind and heart to it - WE ARE PROUD TO CELEBRATE OUR 3rd Anniversary - we have so much to offer !! !